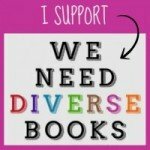 Welcome to the EVEN MONSTERS Virtual Tour & Giveaway courtesy of Sourcebooks Jabberwocky! 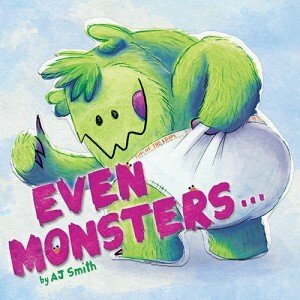 Even Monsters … written and illustrated by A.J. Smith, Sourcebooks Jabberwocky, 2014. Be sure to scroll down to devour every last morsel of our exciting EVEN MONSTERS by A.J. Smith art contest, giveaway, interview & EVEN more!! MONSTER ART CONTEST: Even the bravest little monsters can be scared of what’s lurking in a closet or under the bed. Author and illustrator A.J. Smith’s family-friendly picture book, Even Monsters (Sourcebooks Jabberwocky, $16.99, Ages 4-8 ) written and illustrated by A.J. Smith, is perfect for helping children understand that sometimes the things we are afraid of are not scary at all. In fact, they can be quite funny – see Fur of The Loom undies above!! To help kids overcome their fear of the dark and see how silly monsters can be, A.J. invites them to participate in the Monster Art Contest. 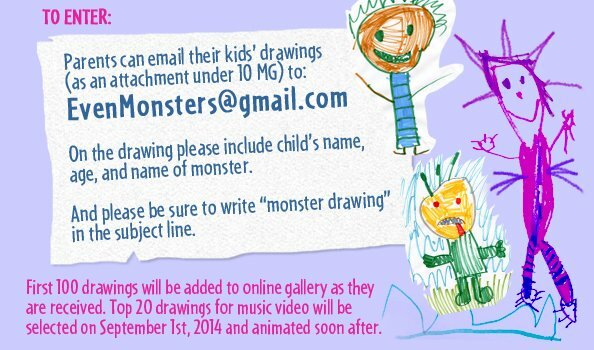 Children ages 2-9 can send in their best monsters drawings for the chance to have their art animated into their own music video! The best 100 drawings will appear in a special Even Monsters art gallery, and the top 20 drawings will be animated into their own music video. WOW! Hi AJ! EVEN MONSTERS is ADORABLE and something both my kids would have loved when they were younger. There’s something to discover on every page meaning kids will want to go back again and again to see if they can find something new. GRWR: With that last sentence in mind, did you deliberately include those tiny cute orangey-red, big-eyed creatures for kids to seek out on every page (and perhaps count)? GRWR: I noticed a lot of broken items scattered throughout the book and thought you got into the young monsters’ heads quite well. Were you a monster when you were growing up? A.J. SMITH: Kids (and monsters) can sometimes be destructive even when intentions are at their best. That said, I was an exceptionally gentle and thoughtful child who never did anything wrong. It’s possible my parents may have their own perspective on the matter, however. GRWR: What prompted you to take this picture book one step further by introducing the digital element where kids (with help from their parents) can scan the QR codes throughout the book for assorted fun activities? A.J. SMITH: I like the idea that a children’s book is a toy. Yes, it’s hopefully an eventual gateway to bigger literary endeavors. 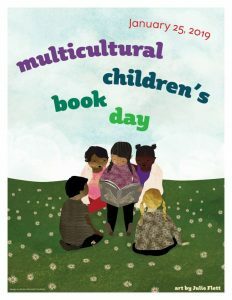 But in the meantime, a picture book should encourage interactivity and play. QR codes were just one more way for me to help facilitate that, which then brings you to more content online that revolves around Even Monsters. 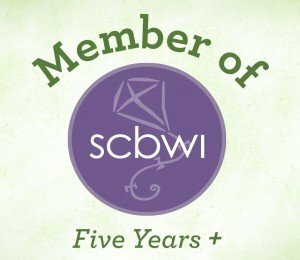 GRWR: Aside from the fact that you’re obviously very talented, what else would you say influenced you to first enter the world of animation and designing? A.J. SMITH: Thanks for the kind words. I’ve always liked to draw from a young age … Always enjoyed cartoons and books. I could talk all day about specific influences from pop culture to everyday events in childhood. But mostly I just always wanted to create stories and make people laugh. Animation, design, illustration, and writing became the best ways (for me) to make that happen.